The six wineries in Lake Country (which is between Kelowna Airport and Vernon) have organized themselves into what is called The Scenic Sip. The object is to lure wine tourists to the bucolic back country now that there are enough wineries for a solid day of touring, including lunch at Gray Monk, the original winery in this region. For those wanting less than a full meal, most of the other wineries offer picnic areas. It really is a scenic area (but where in the Okanagan is it not scenic?). A tour, assuming you drive north from Kelowna, begins with the baronial tasting room at Ancient Hill Estate Winery, just east of Kelowna’s airport. The crowd favourite here (and mine) is the winery’s bold Baco Noir. From there, one proceeds north on Highway 97 into what locals still know as Winfield. There are road signs directing travellers to Arrowleaf Cellars, Ex Nihilo Vineyards and Gray Monk Estate Winery. These three are clustered close to each other. There is not a wine anywhere that is not outstanding. Ex Nihilo has a sophisticated Riesling. Arrowleaf does wonders with Gewürztraminer and Gray Monk has lovely sparkling wines. At Gray Monk, ask for directions before heading further north on roads paralleling Okanagan Lake. Intrigue Wines and 50th Parallel Estate are the northernmost wineries on The Scenic Sip. Both offer excellent wines in friendly tasting rooms but that is where the similarities end. Intrigue is owned by two couples with day jobs: for example, Roger Wong, the winemaker, also is a key member of Gray Monk’s winemaking team. Intrigue is a comparatively modest winery, although the wine shop is well appointed and there is a good picnic area. The flagship wines here are the Rieslings. Roger has an affinity for the variety he considers one of the best for the Okanagan. 50th Parallel Estate, near Carr’s Landing, is turning itself into a grand destination winery. Construction is underway this year to build a showpiece winery. The current tasting room is already elegant, with a lovely curved tasting bar crafted from recovered beams that used to hold up another building on the site. 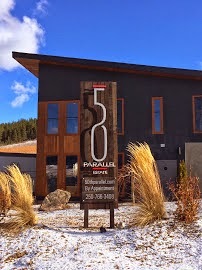 50th Parallel also is setting out to specialize in Pinot Noir and aromatic whites. Last year Grant Stanley, the former winemaker at Quails’ Gate, became a partner at 50th Parallel. His decision to buy into the winery was driven by his passion for Pinot Noir. He once told me he spends 80% of his time thinking about Pinot Noirs. It is obvious that he reserves quality time for his other wines as well. Here are notes on current releases from two of The Scenic Sip’s wineries. Intrigue Gewurztraminer 2013 ($16.90 for 365 cases). This is comparatively delicate Gewürztraminer with a hint of sweetness on the finish. There are aromas and flavours of lychee and orange blossom with a lightly spicy finish. I think the wine needs a few more months of bottle development to express its potential. 88. Intrigue Riesling 2013 ($16.90 for 460 cases). It begins with appealing aromas of lemon and apricot, leading to flavours of lime and green apples. The texture is generous and juicy and the finish is crisp and fresh. The balance is exquisite: the wine’s 23.9 grams of residual sugar are offset by racy acidity. It has a moderate 12.7% alcohol. The wine was awarded “best of varietal” at the spring wine festival – a good judging call. 92. Intrigue Pinot Gris 2013 ($16.90 for 385 cases). The heavy Burgundy bottle and the slightly pink blush signal that Roger Wong has raised the complexity of the wine in this vintage. The wine begins with aromas of pear and grapefruit. On the palate, the texture is rich, with flavours of ripe peach and pear. There is a delicate note of spice on the finish. 90. Intrique Social 2013 ($14.90 for 385 cases). This wine is the successor to a series of blended whites that were named for the vintage year, beginning with 8 (in 2008). Lest any consumer be superstitious, the wine that would have been 13 is now called Social – and it comes in a wild and funny bottle. The blend is 74% Riesling, 20% Gewürztraminer and 6% Muscat Canelli. Flavours of grapefruit and honeydew melon dance on the palate. The touch of residual sweetness fleshes out the texture and the delicately spicy finish. The fun personality of the wine fits the bottle. 90. Intrigue “I Do” 2013 Sparkling Wine ($19.90 for 550 cases). This wine is Riesling with a touch of Merlot and Rotberger to give it an appealing pink hue. The winery describes it as “lightly sparkling,” implying that this is made in the popular style of Proseco, not Champagne. The minimalist packaging – a clear bottle with minimal etching – showcases the lovely colour. There are delicate flavours of raspberry and strawberry. The bubbles give the wine a creamy mid-palate but the balance gives it a crisp and refreshing finish. 89. 50th Parallel Riesling 2013 ($18). This crisp and refreshing wine delivers aromas and flavours of lime and green apples around a classic spine of minerals. A hint of the developing petrol signals that the wine will age to satisfying complexity. 91. 50th Parallel Gewürztraminer 2013 ($18). There is an echo of Alsace in this wine, with its 14% alcohol and its big ripe flavours. It begins with aromas of spice and lychee, going on to flavours of lychee, peach and honeydew melon. With bottle age, the full texture will develop an Alsace-like richness. The intensity of the fruit is surprising, considering the wine is from fairly young vines. 90. 50th Parallel Pinot Gris 2013 ($19). This winery seems to be carving out a distinctive style with this varietal. The wine is packed with tropical aromas and flavours, including pink grapefruit, nectarine, peach and orange. The texture is juicy but the finish is crisp. 90. 50th Parallel Pinot Noir Rosé 2013 ($18). This pretty wine begins with aromas of strawberries and red peaches. Rich on the palate, it delivers flavours of plum and strawberry. There seems to be a touch of residual sweetness but the wine is balanced to finish dry. 90.